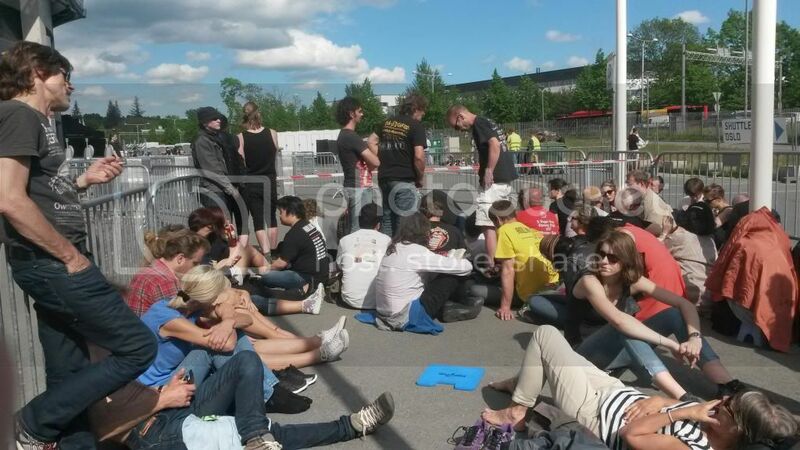 This thread is for live updates and comments regarding The Rolling Stones Oslo Norway 26 May 2014 show. Please tell us your pre- and post-show thoughts and comments here. The wearher is great, blue sky, sunshine, warm, +24 degrees C and The Rolling Stones will open their European Tour 2014 right here at Telenor Arena just outside Oslo at Fornebu, Bærum tonight. Edited 1 time(s). Last edit at 2014-05-26 16:41 by bv. Enjoy the show! Have a great one. Awesome to see Mick looking so good and all the pre-concert buzz. What time does the show start tonight US time? Nice t-shirts, hope they sell some on Pinkpop too. Mick looks well in that picture. then ever. Lucky fans to be there! If you are there, and you ever buy shirts, you should buy a couple each of the Nothern lights and kntted design shirts (the ones in the middle of the picture, #9 and #10, the ones next to the 14 shirt), those will go fast. I dont buy shirts to shows I dont go to, but if I was there I would be all over those 2 shirts, and even better to grab them before the show and take them back to the hotel. Buy 2 each? Yup, one each to wear, one each to keep mint... and if you can find those poster designs, they will be hot too. Edited 1 time(s). Last edit at 2014-05-26 17:26 by Max'sKansasCity. Have fun, my fellow IORRers! and if you can find those poster designs, they will be hot too. Heck, I wouldnt be surprised if they were 150 they seem to be very proud to have very high prices in that part of the world, 40-50 for a simple beer and prices like that. Enjoy the gig everyone. I'll be with you in spirit! Please give Mick our love for us who can't be there!! Enjoy! What a great night it will be for all!! I can feel the love outpouring already! Only 1 hour to go in the sun. What time does the show start tonight US time? To calculate your local time when the concert starts (ca. 8:30pm in Oslo), you can use the Time Zone Converter. Wishing the Oslo fans a great time tonight! Please post the words MICK says to the audience, he is looking good in the photo and it looks like he is very happy to be there. The Northern Lights T-shirts look beautiful! Please post how many songs Mick T gets tonight! This is so exciting! Have fun! Just got in side the Arena. Big Pit for maybe 500 people or more each side. Also new backdrop to stage.